by Johnny Hughes: Over the years, the perception of yoga has changed drastically, and it is now practiced by both men and women all around the world..
Over the years, the perception of yoga has changed drastically, and it is now practiced by both men and women all around the world. Not only is it a great way to stay in shape and improve your flexibility and core strength, but there are also many mental and spiritual benefits which ensure that it is beneficial for anyone to practice. You are now seeing more and more pro athletes turn to yoga to aid their performance, but this is a relatively new development as it previously had a reputation as being a practice not helpful for the physical nature of leagues such as the NFL and NBA. In addition to helping improve strength and helping people to relax, yoga can help to improve performance in a number of different sports. You will now find that many teams will have their entire squad practice yoga in addition to their regular workouts, and in many cases this seems to be paying dividends as hugely successful teams such as the Giants, Seahawks and Duke basketball team regularly practice yoga. It is not always enforced by the organization however, and some of the best athletes in the world have taken it up and cannot speak highly enough of how it has helped them. For some athletes it helps to improve strength in weaker areas, it can help improve flexibility and consequently improve form, and improving core strength will always help athletes to improve their longevity along with performance. 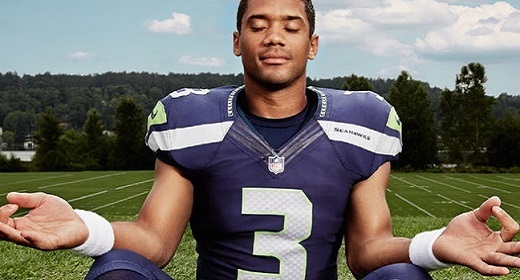 A lot of athletes also practice yoga as a way of relieving stress, as these athletes are under immense amounts of pressure from the public, media, as well as their team. Yoga allows them to relax, unwind and crucially stay focused for the season. Here are 15 athletes who practice yoga. When you are the best basketball player on the planet, there is an awful lot of stress on your shoulders. LeBron James is a huge fan of yoga and claims it has a big impact on his success. For LeBron, regular yoga has helped him to strengthen his muscles and avoid injury (he rarely misses a game), but as he correctly states “yoga isn’t just about the body, it’s also about the mind,” and it helps him to stay focused throughout the season and in the playoffs. Judging by his recent mammoth performances, perhaps we should all follow suit.